Our Highrise integration allows you to add customer contacts from ongoing or archived chats and save them to your Highrise CRM. You can add chat transcripts to already created contacts and create New Deals for clients who are chatting with you. The deals and transcripts can also be accessed in the Highrise Administration Panel. What’s more, if a client starts a chat using the email from the previous conversations, LiveChat will automatically display gathered data in the chat. Highrise is a CRM software which provides a set of features helpful while managing both contacts and clients. It allows storing and sharing profiles of your leads with your team members. You can also easily import contacts directly from LiveChat, MailChimp, Gmail, Excel, Outlook, and other 3rd party apps. What's more, Highrise lets you send emails directly to clients and link these emails to contact profiles. Thanks to that, you can have all the information in one place. The solution facilitates project management. You can create tasks and assign them to different team members as well as receive reminders via email or SMS. Also, your colleagues can add notes to contacts for review by other team members. Apart from that, the tool comes with advanced privacy settings that let you decide which information will be shared and with whom. Integrate LiveChat with Highrise and gain new Contacts and Deals straight from the chat. All of that without leaving the LiveChat application! Thanks to the Highrise integration, you can attach a chat transcript straight to your customers' profile and have an insight into his case. With LiveChat for Highrise, you can now immediately see with whom you are chatting with. All that you need is your customer's email and LiveChat will automatically look for it in your contacts database. It's that simple! The context gained from CRM records is key for sales and support team as they chat live with prospects. This integration provides that context right where they work - in the LiveChat agent app. Display Highrise data in your chat window and instantly create a clear picture of your customers. 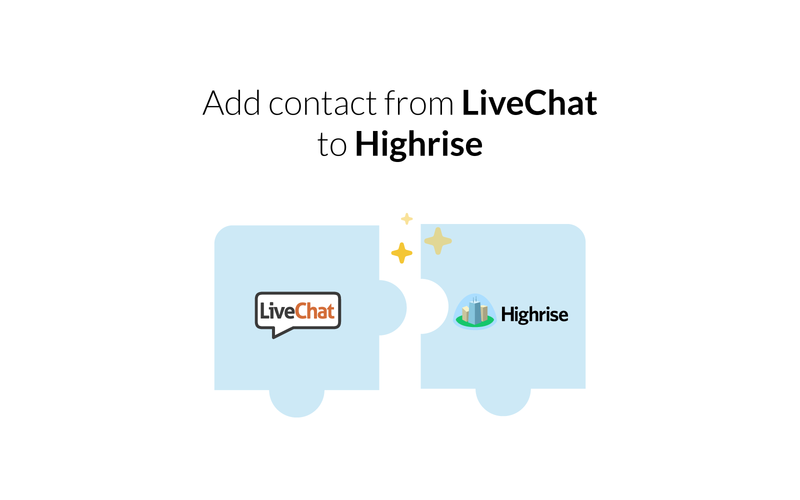 Start using LiveChat with Highrise now!